If you're a minor who lives in Arizona and would like to get a job but aren't sure what the minimum legal working age in the state is, get the facts about the rules and regulations that apply to you. If you're itching to save up for a car, pay for college expenses or simply want some extra cash for clothes, video games, and entertainment, there are ways in Arizona to earn your own money as a young person. How Old Do You Need to Be to Work in Arizona? Most juveniles across the United States may generally begin working at age 14 since federal child labor laws mandate that age as the minimum needed to work, although there are some exceptions. But what happens if state law and federal law don't agree on a minimum age to work and which permits do young people need to begin? When there is a conflict between federal and state laws, the more restrictive law will apply. So, if a certain state mandates age 15 as the minimum needed to work, state law will take precedence since it's more restrictive than federal law in this case. 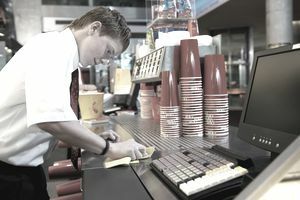 In Arizona, however, 14-year-olds can begin working in a number of settings, including offices, theme parks, movie theaters, grocery stores, restaurants, and retail establishments. Also, they do not need an employment certificate to work. While 14-year-olds can work in a number of places, several work settings remain off limits to this age group. For example, 14-year-olds in the Grand Canyon State are generally prohibited from working in construction, warehouses or factory settings or in occupations that require them to drive or assist a driver. Given that 14-year-olds are not legally permitted to drive cars, this makes perfect sense. Teens in the 14-15 age group may not work more than three hours on school days and no more than eight hours on days when school is closed. When school is out, these teens may not work more than 40 hours during a workweek. By the time Arizona teens turn 16, they have more freedom in the workforce. However, they are prohibited from working in positions that the secretary of labor deems dangerous. Teens in this age group may not work as miners, loggers, roofers, in positions that require them to operate power-driven machinery and many similar fields. What Can Tweens Do to Earn Money? If you're an Arizona teen under 14, don't dismay; you can work in limited capacities. That means working as a paperboy or girl, earning cash as a babysitter, helping out your parents in the family business or on the family farm. If you're an actor, singer or another type of performer, you can also work in a number of arts industries. For more information on working as a minor, visit Arizona's state labor website. If you're curious about labor requirements for minors in other states, visit minimum age to work by state.